Gordon Parks is a name that was immediately familiar to me from the photography books I have read, however, my exposure to his photographic work is limited to his most famous portrait of Ella Watson (American Gothic, Washington DC, 1942) – I will discuss this in more depth later. Gordon Parks was a trail blazer in many respects – part of Roy Stryker’s Farm Security Administration, in the late 1940s he became the only African American photographer on the staff at Life magazine and the first black director of a Hollywood film with the ‘The Learning Tree’ in 1969 (in 1971 he directed the famous blaxploitation film ‘Shaft’.) As an African American man, that he managed to work within such institutions and still produce confrontational work that addressed questions of civil responsibility, human rights and modes of representation is remarkable given challenges he must have faced on a daily basis. Parks came to photograph Ella Watson as part of his work for the FSA in 1942. Watson was a cleaner in a government building in Washington DC, the exhibition text describes how Parks was shocked by the level of racism he encountered in the capital and expected better. Roy Stryker, head of the FSA, pointed out Watson to Parks and suggested he speak to her as he ‘might find her interesting’. 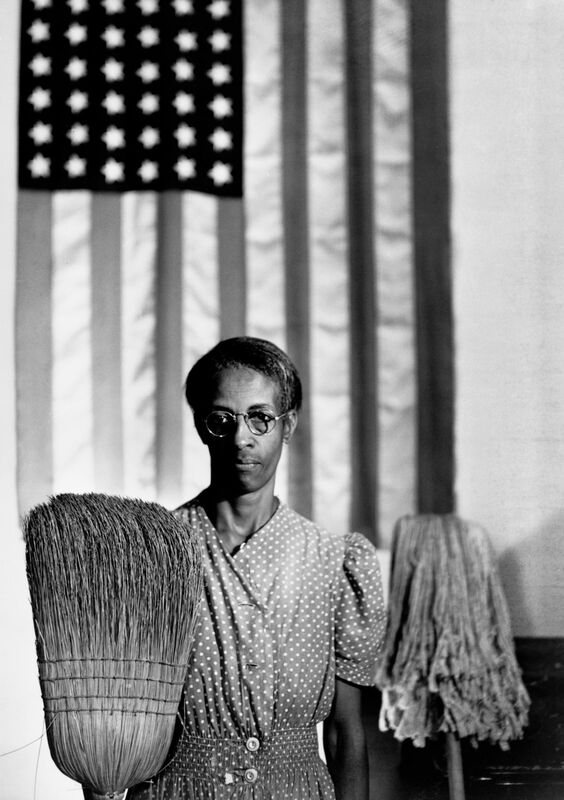 The famous picture that was made that day, ‘American Gothic’ which shows Watson standing in front of the stars and stripes holding a mop and brush, was described by Stryker as a picture that could ‘get us all fired’. Stryker’s reaction demonstrates the overt racism present in 1940s America and is a dramatic assertion of the power that photography holds – by referencing Grant Wood’s 1930 painting of the same title, a work that has been interpreted as a depiction of the American pioneer spirit, the ambiguous expression held by Watson becomes a challenging returned gaze which has the potential to make the viewer uncomfortable. There is a clear reference to slavery, which, despite having been abolished seems to still exist because of the job of service Watson is engaged in. Watson appears both defiant and stoically resolute – the aspect of the image that would make a white audience uncomfortable, even angry, is the quiet dignity with which she holds herself. The famous picture of Watson is accompanied with more traditional documentary images with her family at home. These give a more rounded portrait of both Watson as a person as opposed to an icon, and while it is clear she and her family have very little, there is a warmth and tenderness in the pictures that must come from Parks’ empathy with the family and the ease they must feel with him. This section of the exhibition focuses on Parks’ work for Life magazine in the 1960s. This was a turbulent time for race relations in America, and Parks took the opportunities afforded to him to document the movements and individuals fighting for civil rights and challenging the institutional racism of the time. The subjects featured include Muhammad Ali, Dr. Martin Luther King Jr., the Black Muslims and the Black Panthers. The striking thing about this section for me is the variety of images – some posed, some that could be classed as pure documentary, but all underpinned with a sense that Parks has captured a particular moment that has resonance. 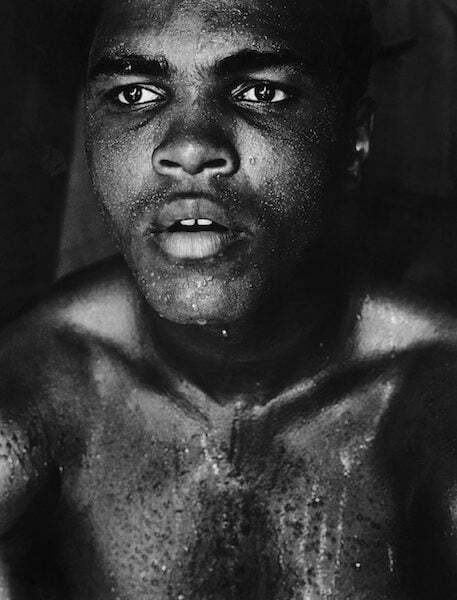 Some of the images have the iconic sense of ‘American Gothic’ such as this shot of Muhammad Ali. This is counterpointed with another image that focuses on Ali’s fists, scarred and bruised from his work as a boxer but clenched firmly and ready to fight – an image that could be read as a metaphor for the fight against racism. 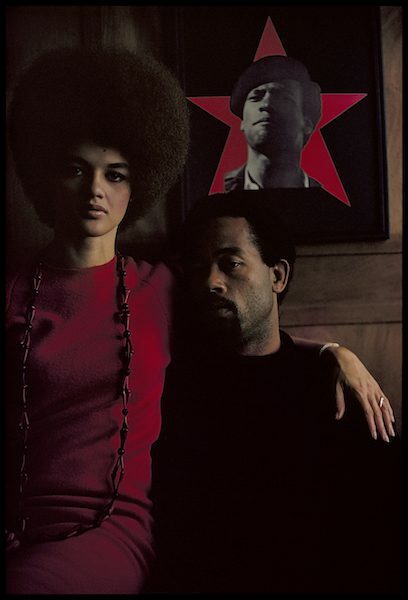 A portrait from a feature on the Black Panthers of Eldridge and Kathleen Cleaver stands out at first because of the use of colour. 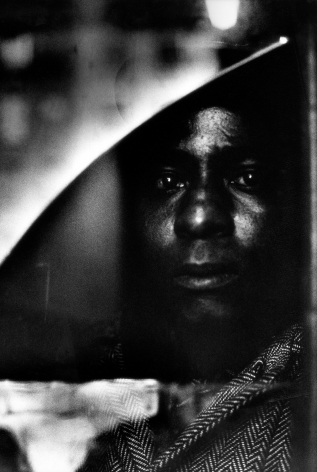 (Interestingly, this image is shown in black and white on the Gordon Parks Foundation website.) The sense of pride in black identity and Parks’ support for the cause is evident in this portrait. The equal gender relationships between the Eldridge and Kathleen is also significant, if anything it could be argued that it is Kathleen that holds the dominant position in the frame. If there is any doubt about the revolutionary iconographic intentions of the picture then this is clarified by the inclusion of a poster of Black Panther leader Stokesley Carmichael surrounded by a red star. 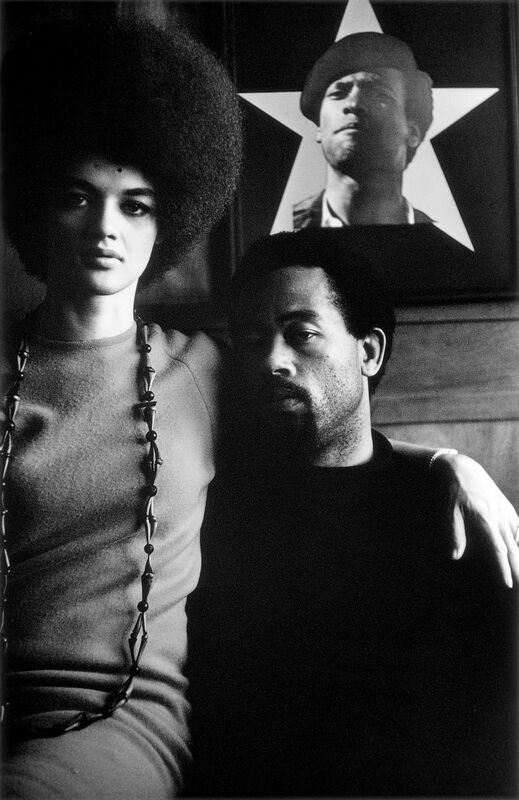 Eldridge Cleaver and his wife, Kathleen, Algiers, Algeria, 1970. From the Life magazine feature, Black Panthers. This section shows a 1956 colour photo essay by Parks of Alabama which was still segregated racially. The danger Parks faced completing this essay is emphasised by the text which contains a note from his diary recording how he narrowly escaped a band of hostile white men who had learned what he was doing and were looking for him. Later, Parks realised that they had been tipped off by a Life staffer who was meant to be assisting him. 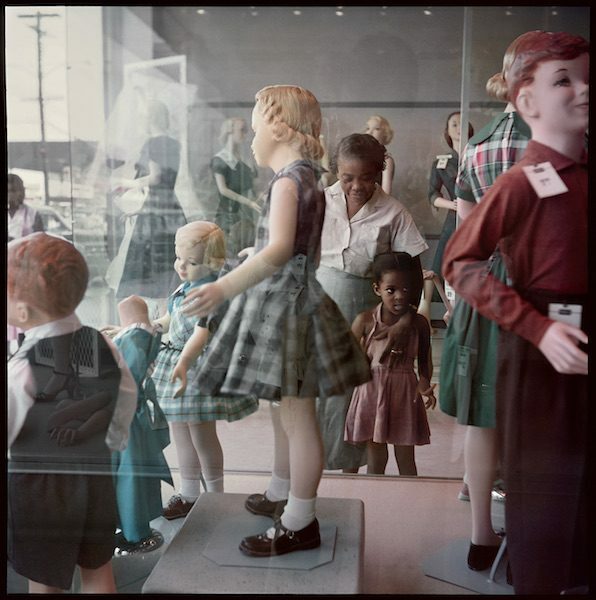 Two particularly images stand out for me, the first, Department Store, Mobile, Alabama, 1956 seems rather heavy handed on initial viewing with the large, neon ‘colored entrance’ sign at the top of the frame. Considering this thought I was struck by the idea about whether it would be appropriate to show the reality present in the picture in any other way. 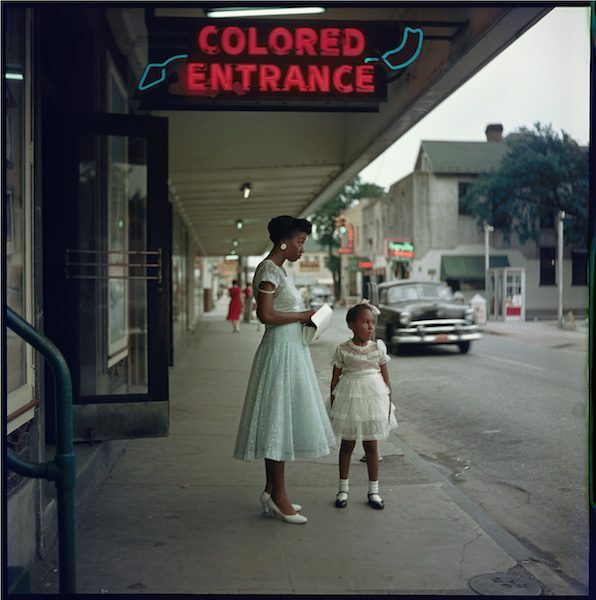 To signpost the segregation inherent in Alabama at the time using a large illuminated sign is crass and offensive – offensive because it is deemed acceptable to show the racial divide in such explicit terms. It is right that Parks chooses to highlight this in such a direct manner. There are more subtle details in the image as I look closer that make it intriguing. I wonder what event the two girls are about to attend dressed in what must surely be their best clothes. The younger girl displays the innocence of her years and looks bored to be waiting. The older girl seems pensive and serious, perhaps concerned to be dressed so formally in such an open setting. Her posture is stooped and although she is immaculate, there is a sense she is uncomfortable being dressed this way. The bra strap that has fallen off her shoulder emphasises this. The second image is an artfully composed shot of Ondria Tanner and her granddaughter looking at clothes in a department store window. The mannequins seem particularly creepy in this display, and most strikingly, but not surprisingly, they are all white. There is nothing about the demeanour of the child and grandparent that are the subject of the photograph, and that is what is disturbing about it – that the young girl is about to grow up in a world in which she will struggle to see images of herself with which she can identify. This subtle form of racism is a type of exclusion that suggests the lifestyle and aspirations shown through the shop window are not to be shared. This section is seen by Mark Sealy as the ‘keystone’ with which to understand the entire exhibition and the work of Parks. 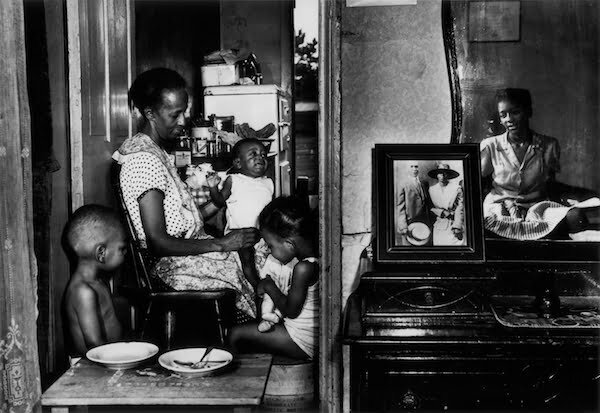 Alongside exhibition prints from the series, the original Life magazine feature about the Fontenelle family, ‘The Cycle of Despair’ is reproduced and a 20 minute documentary film ‘Diary of a Harlem Family’ is also shown. The essay emerged as a response to the race riots which broke out across America in 1967 with Parks producing an extended documentary project about the extreme conditions of poverty faced by one particular African American family living in New York. Sealy sees this body of work as remarkable on many levels and that Parks chose (and was allowed) to respond to his brief from Life to explain the riots by focussing on a single family is extraordinary. The success of the work is that Parks does not show the family as ‘others’ – objects of journalistic scrutiny, but as individuals participating in and telling their own story. The struggle for survival of the Fontenelle’s is bleak and devastating – a relentless pressure through which they struggle to cope. While not overt, it is clear that Parks is clearly demonstrating how such terrible living conditions and deprivation could fuel discontent. The story itself is a complex and harrowing one that runs the risk of losing sympathy for the family itself. Parks does not moralise either about the circumstances that have led the family to be living in such poverty or the choices that they make which could be viewed as furthering their suffering. The story concludes in abject tragedy – frustration at being out of work leads the father of the family Norman Sr. to get drunk and he beats his wife Bessie and son Norman Jr. Not being able to take the abuse anymore, Bessie to pour boiling water and honey over Norman Sr. as he slept. Norman Sr’s. response to the attack is a pitiful summary of the situation as he laments that he does not know why his wife did it. Parks stayed in touch with the Fontenelle family for the rest of his life and he described his time with them as something that haunted him. It is this real empathy that explains the power and success of Parks work and in my opinion is what elevates it to something that is beyond simple reportage or documentation. 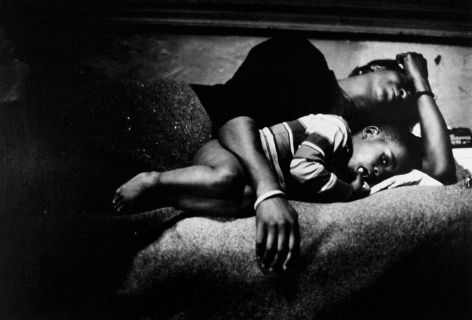 I found Gordon Parks: A choice of weapons one of the most enriching photography exhibitions I have ever seen. I hope that photography can be used as a force for social change and to highlight inequality but have doubts about whether this is possible. I find Parks absolute clarity in his belief that he can make a difference through his photographic work and his drive to provide a voice for African Americans at a time when they were not only marginalised but actively oppressed inspirational. I also admire the curation of Mark Sealy who manages to give an overview of Parks substantial archive while allowing individual stories, particularly that of the Fontenelle family, to be told in detail. The obstacles Parks must have faced in his career must surely have been immense and the fact that he managed to produce work of this power and conviction within the mainstream is incredible. I feel like I have only scratched the surface in learning about his work and feel inspired by his core strength and belief in the stories he wants to tell.